Pop ups are member sponsored events that don’t fall under the categories of our established SIGS. They can include members and nonmembers as participants and take place throughout the year. They must be scheduled with, and cleared, in advance, by Nora Sirbaugh (Vice-President) in order to avoid conflicts with events planned by the SIG leaders, who have first dibs on dates, and with other members planning pop ups. HPS Refund Policy, click here to view. Learn how to create your own hypertufa. Registration is closed. To be added to the wait list, click here. Visit to Ed and Debbie Shinn's incredible two-acre Japanese Maple Garden, quite close to the Jersey Shore in zone 7b. Click here for more information. Tour of The Woodland's property, followed by a BYO lunch. Click here for more information. Learn how to add interest and direct the garden visitor's eye any time of the year. Click here for more information. 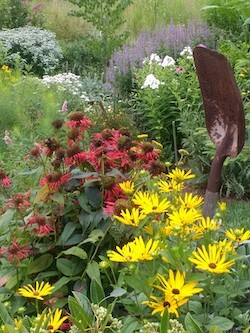 Come visit the garden of Lucille Amadie a Barnes graduate, Master Gardener and Landscape Designer in Bala Cynwyd . Click here for more information. At our annual meeting in December, Caren White, who guided us through a delicious trip in the The Mixologist's Herb Garden. Her fun and informative lecture taught us that herbs are not just for cooking! She has invited us to the Herb Garden of the Holcombe-Jimison Farmhouse Museum and Garden in Lambertville, NJ where she maintains the herb garden there. Click here for more information. We will visit the Goodly Gardens, a safe and nutritious haven for pollinators and wildlife. Click here for more information. Philadelphia's booming publishing industry resulted in the training of many gifted artists, click here for more information. Bluebird House Workshop-Jerry Vernick lead a bluebird house workshop.